Around 80 detainees and over 200 of their supporters are on hunger strike in Egypt in protest at repressive laws which the military regime is using to criminalise dissent. According to Egyptian human rights activists around 40,000 have been detained since July 2013, many of whom have been locked up in appalling conditions without charge or trial. They include Sanaa Seif, a 20 year old student who was arrested on a peaceful protest against the jailing of her brother and 23 others for 15 years and as a result has been in detention since the 21st of June. Solidarity makes a real difference. Alaa Abdel Fattah and two other activists who launched the hunger strike campaign in August were released on bail on 15 September. We need to make sure that the campaign grows even stronger for those who remain. 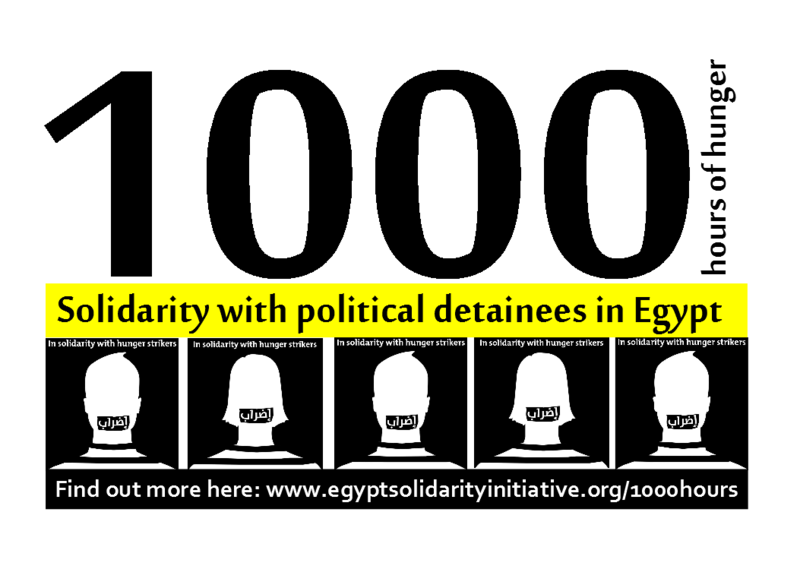 Activists in Egypt have launched a call for international solidarity with the hunger strikers in detention. We are organising a series of symbolic 24 hour hunger strikes to highlight the campaign, beginning on 22nd September at SOAS. Can you help us reach 1000 hours of hunger? If you are willing to take part in our campaign please sign up online here (please read our solidarity hunger strike guide first). Scroll down for more resources and ideas for solidarity actions.